Why take Sanatogen Vital 50+®? 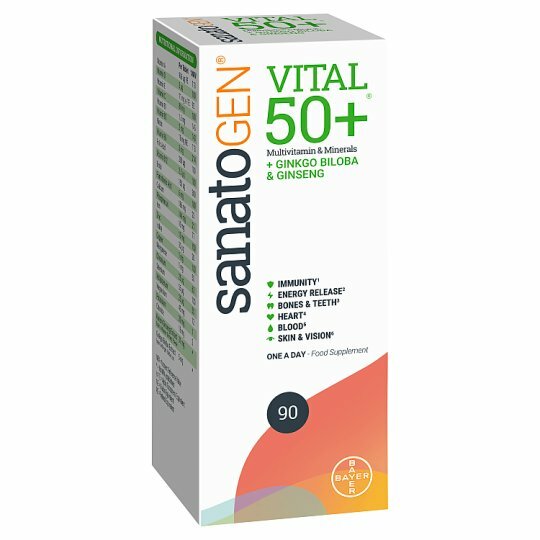 Sanatogen Vital 50+® is a source of 22 essential vitamins and minerals specially designed for adults 50 years old and over to help maintain health and vitality. The high levels of B Vitamins such as B1 and B2 help to support energy levels, whilst the high levels of Vitamins A and C help your immune system to function normally, that's why Sanatogen Vital 50+® helps you stay on top form as you get older and your daily nutritional needs change. Vitamin A, C, Iron and Zinc contribute to the normal function of the immune system. Vitamins B1 and B2 contribute to normal energy-yielding metabolism. Vitamins A, B2 and Zinc contribute to the maintenance of normal skin and vision. Vitamins C, D and Calcium are needed for the maintenance of normal bones and teeth. Vitamin B1 contributes to the normal function of the heart. Keep in a cool, dry place., For Best Before End: See base of pack. Adults 50 years and over take one tablet a day with water. Taking more than the recommended daily intake may be harmful. This product contains vitamin A. Do not take if you are pregnant or likely to become pregnant, except on the advice of a doctor or antenatal clinic. This product contains Ginkgo & Ginseng. If you are under medical supervision consult your doctor before taking this product. Sanatogen Vital 50+ should not replace a well balanced diet or a healthy lifestyle. Keep out of reach and sight of young children. This product contains Iron which is harmful to young children if taken in excess.